We are working on putting together our FAQ page. Please don't be too critical since this is our first cut at it, but if you have any questions, comments, etc. email us, and we will be happy to answer it and possibly add it to this page. We are active players in several Storm8 games and have maintained spreadsheets to do our calculations. The web offers much more capabilities and also allows for easy sharing of our toolset with others. While we do this mostly for fun, there is a significant amount of time involved as well as hosting expenses so we do post ads on the site to help offset some of those costs. Use the 'Forgot Password' link and follow the instructions to reset your password. How do I find out the latest features and updates? Use the Latest Features and updates page. We will try to keep the page updated so you know the very latest features and changes to look for. I registered and signed in, where did my data go? The first time you access the calculators after logging in, you will have to re-enter your data. This is a one time event. If you are not logged in, the calculators will revert to using cookies, which are only saved locally. We apologize for the inconvenience. Where do I find mission mastery, mission lists, and loot items? At the bottom of each calculator is a block with multiple tabs. Click on the tab labeled 'Quest Items'. You can review, sort, and filter to find the loot item you are looking for or the best quest per energy or per cash. Note: We currently don't have all the calculators populated. Why do I have money left over without anything recommended to buy? We highlight the building that has the highest ROI. Our calculator's only recommend based on buying the buildings in order of highest ROI. We have had the discussion with users in the past about whether we want to recommend lower ROI buildings with whatever money the user has and the majority would rather to keep it this way. For example, if you are a player that logs in every hour and never lets your income accumulate, a 5 billion building which has the best ROI will never be bought because you will never save enough to buy it and the cheaper building ROI's will keep dropping and dropping. In the long run, it is worth it to save for the best ROI buildings. One thing we might do in the future is give people the option to do spend all available. Buying the best ROI building doesn't always lower the difference between your results and optimal. It is a weird phenomenon that happens and we've personal come across this when iMobsters added new buildings. It is hard to understand how it happens, but it has to do with how everything fits in place at the end of the calculations for ROI. For example, the buildings you just bought may have added 1 billion to your total spent, which we use to calculate optimal. That 1 billion bought you a decent building and the cost is added to your total spent, but when calculating optimal, that 1 billion may have been just enough to buy the next ROI building which is 6 billion in its calculations, thus increasing the gap. The way you purchased your buildings over time, you may have some extra cheaper buildings, which may keep you from reaching the cutoff for the more expensive building but highest ROI building leaving more unused money, while when we calculate optimal, it is methodical from the start on buying based on ROI, so it may be able to buy the 6 billion building and leave less unspent. How do I add or remove my game code(s)? To add or remove your game codes, go to the profile screen and click the link at the top of the screen to View and edit your profile. Note: make sure you a logged on. Once you are on your profile, edit the row that matches the game you want to edit your game code for. You can either double-click on the row, single-click and use the enter key, or single-click the row and click on the edit icon. Once your changes are done, either hit the enter key or click on the save icon to save your changes. To cancel your changes click on the cancel icon or hit the Escape key while still editing the row. If you are done recruiting and you want to remove your game code, edit the row containing the game code you want to remove and delete the game code. Use one of the save options and your game code will be gone from the game codes page. How do I save my level, allies, and country name to my game codes? The level and allies comes direct from your calculator pages, so if you keep them up-to-date, your game code information will be also. Additionally there is a field on the game codes section of your profile we call 'Special'. This is for special information, for example, on World War you can put your country name. If you are not logged in, your data will be saved in cookies, which are local to the computer you are using. While using the same computer and the same browser, your data will always be there when you return, but if you clear your cookies, use another computer, or browser, your data will not be there. Rest assured if you return to your original computer, your data will still be there. For registered users, when logged in, your data is stored as part of your account. You can access this data from any computer or phone. Make sure you are always logged in when updating data, otherwise the data will only save to cookies, which are only local to the computer your are using. I am using the same computer, but some of my data on one of the calculators isn't being saved? Your data is currently saved in cookies, and we've seen on at least two occassions that one field in one of the calculators isn't saving the users data. We can only assume the cookie got corrupted somehow. To fix the problem you will need to delete the cookie for that particular page. We've included a screen shot of an example from Firefox. 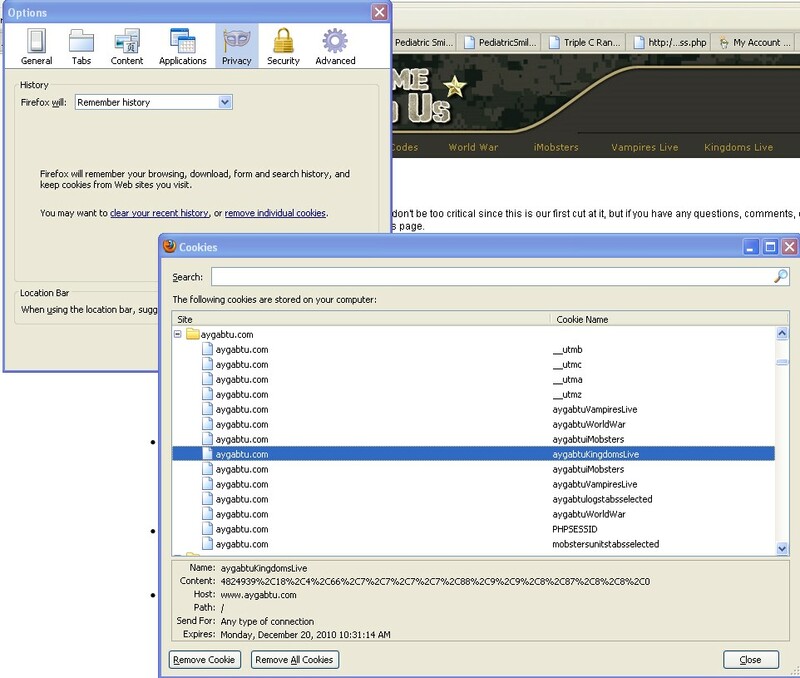 To get to the screen in the image, select Tools->Options from the menu, then 'Remove Individual Cookies', then browse down to 'aygabtu.com'. Highlight the calculator that is giving you trouble and select 'Remove Cookie'. I created my account, why can't I save my calculator information? We've just added support for account creation to the site. While it is working and you can edit information in your profile, g saving game information that you can take from computer to computer has yet to be added. Game data does save locally, so if you use the same computer, you will not lose your data on the calculators. Calculations are done automatically for you. Once you stop typing or release the slider bar for about a second, the page will update based on the new data you input. If you then continue to input data, this process will repeat automatically for you. After any change in data, your data will also be saved automatically. When both income and defense buildings, slaves, etc. are available, the current money to spend will be spent on income and defence based on the position/values of the slider bars. This allows you to decide which way you want to go with your money and purchase accordingly. If you want to split your money, say 60/40, move the income slider bar to 60%, which the defense slider bar will automatically move to 40%, then purchase the buildings the calculator suggests. Note: All inputs fields are highlighted in red. How does the slide bar work? After entering your available money, blood, gold, etc to spend, the slider bar can be used to decide how much of your resources you want to spend. After moving the slider bar to the position you want, calculations for income and defense(where applicable) will be done automatically for you. If you decide you want to spend a little more, or less, just use the slider bar(s) again to have the page update the suggested values again. What are the benefits of the Buy buttons? Once you have input all your data and the calculations for the best buildings are done, you can use the dropdowns on each row to decide how many buildings you will build. The dropdowns match the game selections, but also include a match of the total suggested for each type. If you decide to purchase buildings, you can use the dropdown and the Buy button to update your owned and available money to spend values automatically. Buy buttons are a signicant time saver allowing you to focus more on playing the game instead of a lot of manual entry. Why does the 'Projected' table wrap below instead of staying inline with the rest of the cooresponding table? While we try to keep the screen width at a fixed size and also try to test with numerous scenario's unfortunately browsers, hardware, etc. act differently and we cannot test every scenario. If you find that the projected table wraps or some other part of a page is out of place and you've entered reasonable data, please contact us with the details and we will try to resolve it. Can you add support for other games? It is our intention to add support for all Storm8 games and we are also considering Facebook games, ie Mafia War. If you have a suggestion, contact us and we will review the possibility of adding a calculator for your suggestion. Because we continue to add content and improve functionality, it is important to refresh your page, at least, on a daily basis if not more often. This will ensure the page you have loaded is the most up-to-date. Why don't you have missions and other game information? The site is just getting started but in the future, if there is enough interest, we will add more game information to the site. For now we are focused on the most used and important information and we want to provide it the best way possible before we add more content. Why can't I edit my unit information? The site is just getting started but in the near future, after we allow for account creation, we will focus on allowing users to enter their unit information. What does active user and online users mean? Active users are defined as all user currently using their browser somewhere on the site and with either a page refresh or calculation done in the last 10 minutes. Online users are any user that currently has a browser window open on the site. We think it is a nice feature and interesting to other users to know you are not alone, which is why we provide this information. In the future this will be used for chatting, finding your online friends, etc. What do I do when I see a mistake or have a suggestion? Feel free to contact us via email with any comments or questions. We are open to any and all comments and while we may not implement every single suggestion, we will carefully consider and look forward to as much feedback as our users would like to share.